Sales of our wetland manuals are still strong. The four manuals are Volume I - Single Family Systems, Volume II - On-Site Collection Systems, Volume III Municipal Systems and Volume IV - Plant Identification Guide. We have sold to over 30 states and Australia, Hong Kong, India and New Zealand. For ordering information contact the RC&D office. This booklet presents the basic principles of sound design as well as the keys to successful construction. There are also tips for plant selection and typical seasonal management that keep a micro-wetlands working and looking great. To obtain a copy of this brochure at no cost, contact the RC&D office. 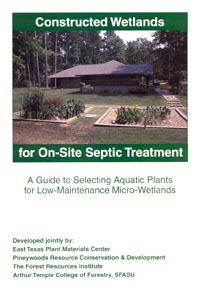 This booklet is a guide to selecting aquatic plants for low-maintenance constructed wetlands. Also included is how to install plants and system maintenance. 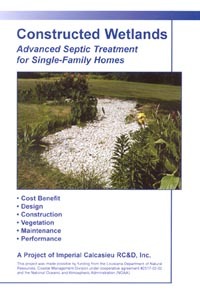 To view the entire brochure go to the link to the left "Wetland Brochure". To obtain a hard copy at no cost, contact the RC&D office. 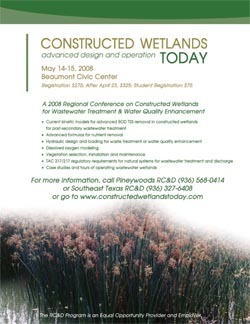 The Pineywoods RC&D and Southeast Texas RC&D hosted a 2-day conference on May 14 and 15, 2008 in Beaumont on the current status of constructed wetlands for wastewater treatment. In east and southeast Texas, constructed wetlands have been utilized by many towns, utility districts, and school districts for wastewater treatment. There are many advantages to using this technology including low energy cost, and minimal maintenance. This technology has been actively implemented for the past 10 to 15 years in our area and the conference was held to address changes in the design and operation for these systems that has evolved. The conference featured leading authorities on systems design and operation. The 75 conference participants learned about the current information available on system designs, wetland bio-chemistry, wetland vegetation, operation of systems, and also current and new regulations concerning wetlands. Also included in the conference were tours of operational systems including the system for the City of Beaumont, City of Winnie, and the system being used for the High Island Independent School District. The Conference would not have been such a success without the hard work, extensive planning, and support from the conference partners, sponsors and steering committee. 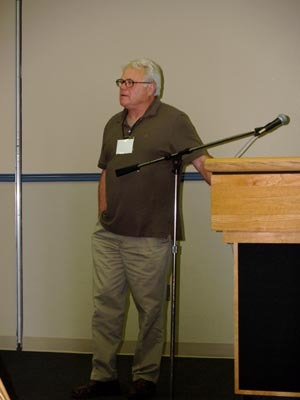 Dr. Robert Gearheart, Professor of Enviornmental Resources Engineering of Humboldt State University discusses the application and design of wetlands for managing water quality. Allen Sims, P.E. 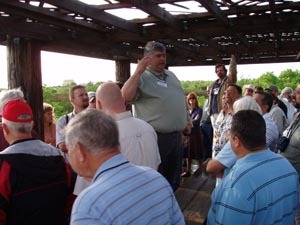 vice president with Carroll & Blackman, Inc. leads the tour at High Island ISD constructed wetland from the Bird Observation Deck, adjacent to the wetland. The system was built in 2000 and is located on property donated by the Audubon Society and serves as part of a multi use birding facility. Pineywoods Resource Conservation and Development, Inc.